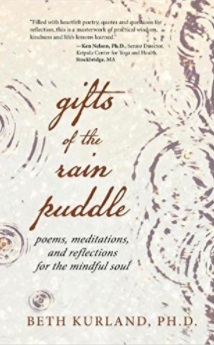 Beth Kurland, Ph.D., is a clinical psychologist in Norwood, MA and author of the books The Transformative Power of Ten Minutes: An Eight Week Guide to Reducing Stress and Cultivating Well-Being (awarded Finalist in the Health and Wellness category by Next Generation Indie Book Awards), and Gifts of the Rain Puddle: Poems, Meditations and Reflections for the Mindful Soul. Beth has been in practice for over 20 years, working with children, adolescents and adults across the lifespan. She specializes in using mindfulness and mind-body tools to help her patients experience whole person health and wellness. Her website, BethKurland.com, offers a monthly inspirational blog and many free meditations that can be fit into even the busiest person’s life, to help reduce stress and inspire well-being. I am able to be very present when I am with people, and I am able to help others feel listened to, heard and understood. I am naturally empathic in a way that allows me to hold a space for other peoples’ pain in a compassionate way, without internalizing it as my own. I also can easily see things from different perspectives, which helps me to connect with people from many walks of life, and also minimizes conflict with others in my personal life. My commitment to living a healthy lifestyle and making time for self-care. I eat healthfully, exercise consistently, try to get enough sleep, and have a regular meditation practice, and these things replenish me and allow me to show up at my best. I also have a lot of drive and perseverance, and that has helped me to accomplish things in my life that are most important to me. I love writing, and I have at least one more book in queue and two more that I’d like to write in the near future. 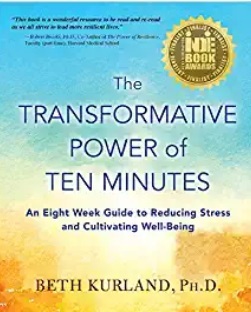 I am trying to pilot an eight-week group, based on my book The Transformative Power of Ten Minutes, in corporations and possibly at some point online. I think that to make change, people need structure, consistency, support and accountability, and I would love to be able to offer that to people in large group settings. Personally, I would love to embark on some meditation retreats in exotic parts of the world, where I can travel, be in nature, and deepen my meditation practice. Raising my two children has been my biggest success, and one of my greatest joys. I didn’t realize how difficult it is being a parent until I became one. I hope I have given my children a strong foundation from which they can blossom into the best versions of themselves. I think I have. My mother died when I was 15, so she never got to see me become an adult. I feel so fortunate that I have been able to watch my children grow into the wonderful, young adults they are. It is hard to pick a specific moment, but I think my biggest challenge was allowing myself to fully grieve the loss of my mother’s death, to embrace my darkest emotions and learn to sit with them rather than run away from them. She died when I was a teenager and at that time I pushed some of these feelings away; but with the help of some wonderful therapists over the years I learned how to befriend my own grief, fear and despair, and this has been immensely helpful in my life. It has helped me to embrace all parts of myself, and to find healing and wholeness. I remember that when I was in middle school, our Rabbi gave a sermon in which he quoted William James, saying “The greatest use of a life is to spend it on something that will outlast it.” That quote always stuck with me, and I think it has become the essence of how I try to live my life. I try to find ways that I can make a difference, whether it is helping others through my profession, raising my children to be caring and kind, writing books and blogs to share with the world or taking the time to recycle the peanut butter jar when it would be easier to toss it. I try to remember that the little day-to-day things can be as significant sometimes as the bigger things. My father has been a wonderful role model for me. He doesn’t just teach us values to live by, but he lives and embodies them himself. Some of these include honesty, integrity, devotion, standing up for what is right, respect for others, and always being a “mensch.” He also is the epitome of aging gracefully. He walks all the time (and recently ran up a very steep hill), is involved in community service, has a memory far better than anyone I know, is active socially, and writes articles regularly. I hope I am living a healthy, active, balanced and fulfilling life like that when I am in my eighties. There are so many people within my psychology field that I greatly admire for the work that they are doing and the contribution they are making in the world – people like Rick Hanson, Daniel Goleman, Richard Davidson, Tara Brach, Kristen Neff, and Barbara Fredrickson to name a few off the top of my head. There are so many more! I love being in nature and am very content in my own back yard, which is very wooded and private. It is my favorite meditation sanctuary in the warmer weather. I also love the wooded trails near my house, which are filled with endless natural beauty. Having always vacationed in the mountains as a kid, I am partial to the mountains and consider Vermont and New Hampshire two of my favorite destinations. My absolute favorite place that I have been is Switzerland. I am not attached to many material things, but I do love my books! Most of the books on my shelf at home are psychology related, self-help or inspirational in nature, and I cherish them all. I also am so excited by all of the online courses that come my way, and if it weren’t for some self-restraint and lack of time, I would buy them all. Oh, and I love my blender. I make smoothies in it every day. For many years I participated in triathlons, and while I no longer compete, I am still very passionate about running, cycling, and swimming. I also enjoy yoga. I love to move my body through space, and that has always been an essential part of my well-being. My biggest current passion, though, lies in finding a way to express myself creativity. When I was younger, my brother and sister and I used to make up all kinds of games. I think we had a list of about 100. I always loved being creative, whether through play or writing or dance. Now in my life, having a whole day to write, or to make a meditation video, feels like being a kid in a candy store.